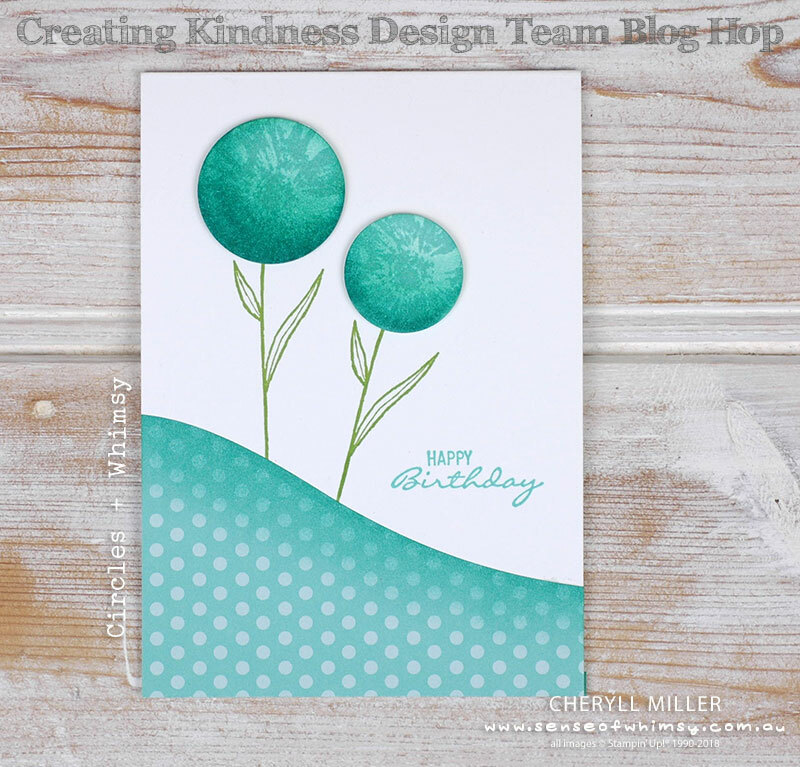 Touches of Texture for Creating Kindness Blog Hop. 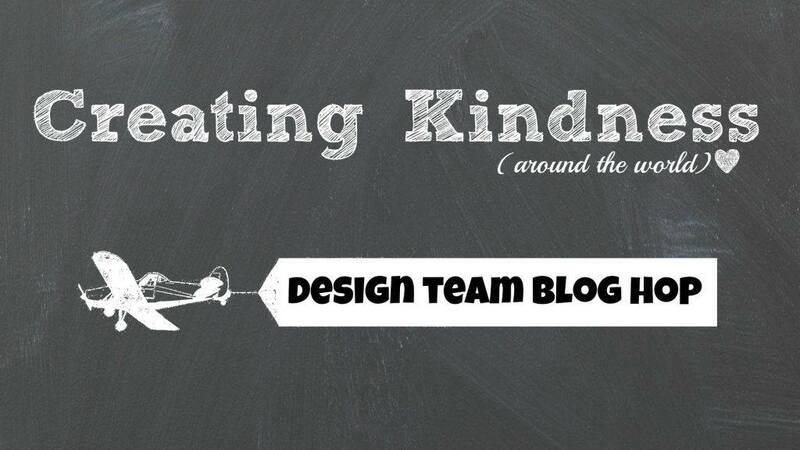 Welcome to the Creating Kindness Design Team Blog Hop for September. The theme of the hop this month is “Circles” … as in going around in! 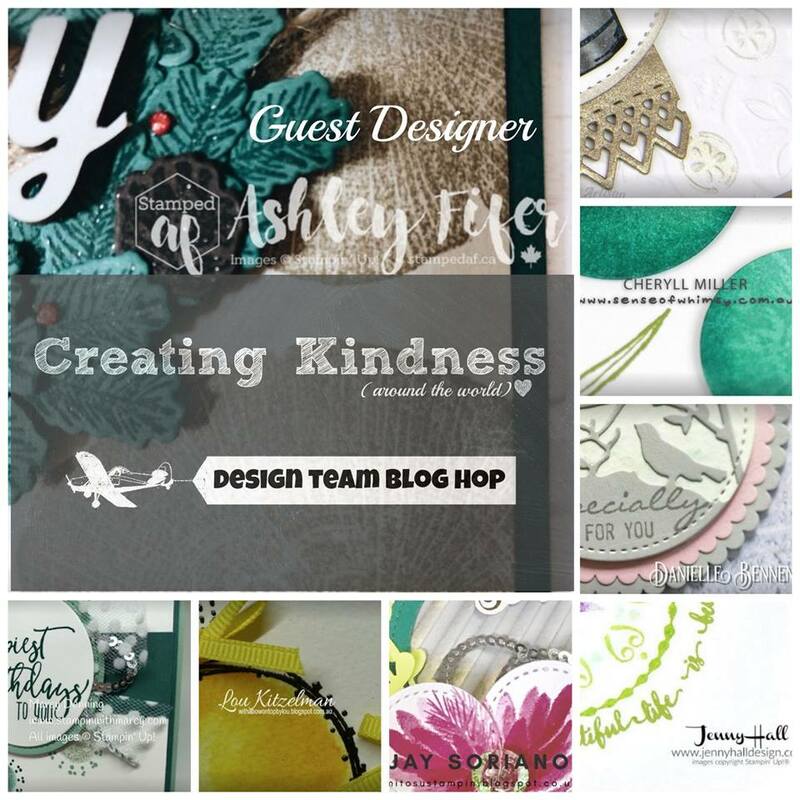 Our guest designer this month is Ashley Fifer … Ashley has a wonderfully refreshing style which I love. Check out Ashley’s work on her blog here! 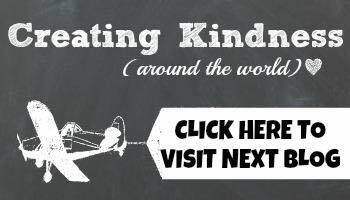 Here is a sneak peek of just a few of the projects this month, just to whet your appetite for doing the full circle circuit of blogs in the Creating Kindness Design Team blog hop. All participants are listed at the bottom of this post. I love circles, spots, dots and spheres and I used them all the time for backgrounds, as a base for a card feature, or to hold a greeting. For this project, I wanted to use circles as a feature. What do you think? This card certainly puts the circles front and centre, in a whimsical sort of way. I die cut the two smallest circles from the Layering Circles Framelits out of Whisper White Thick Cardstock. 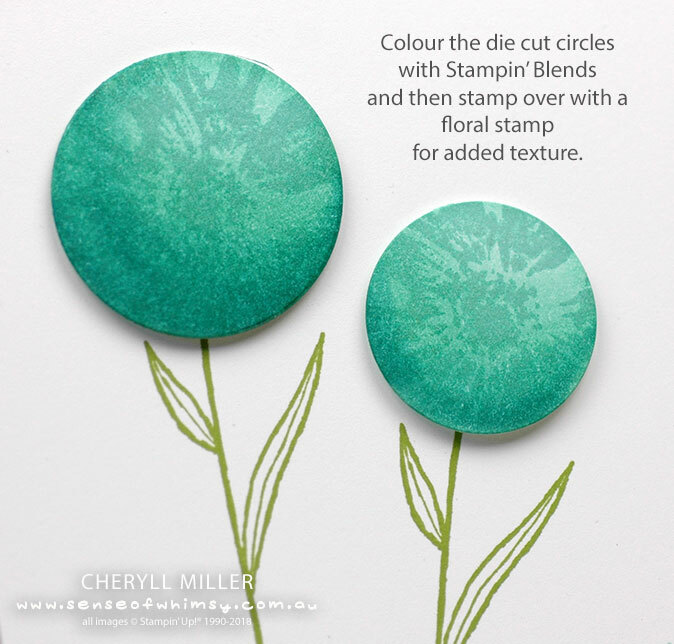 Then I coloured them with Pool Party Light and Dark and Bermuda Bay Light Stampin’ Blends, keeping the highlight at the top of the circle and shading at the bottom of the circle to create the rounded look of a sphere. 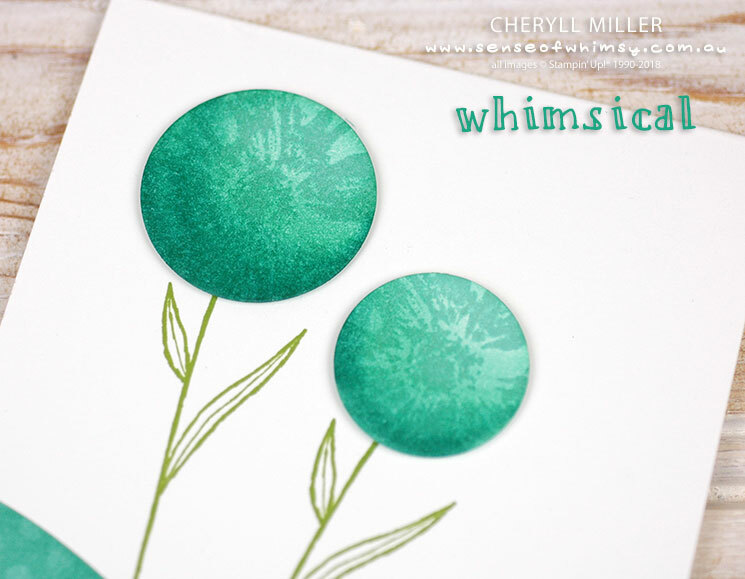 I stamped over the circles with the splatty flower from the Touches of Texture stamp set and Coastal Cabana ink. 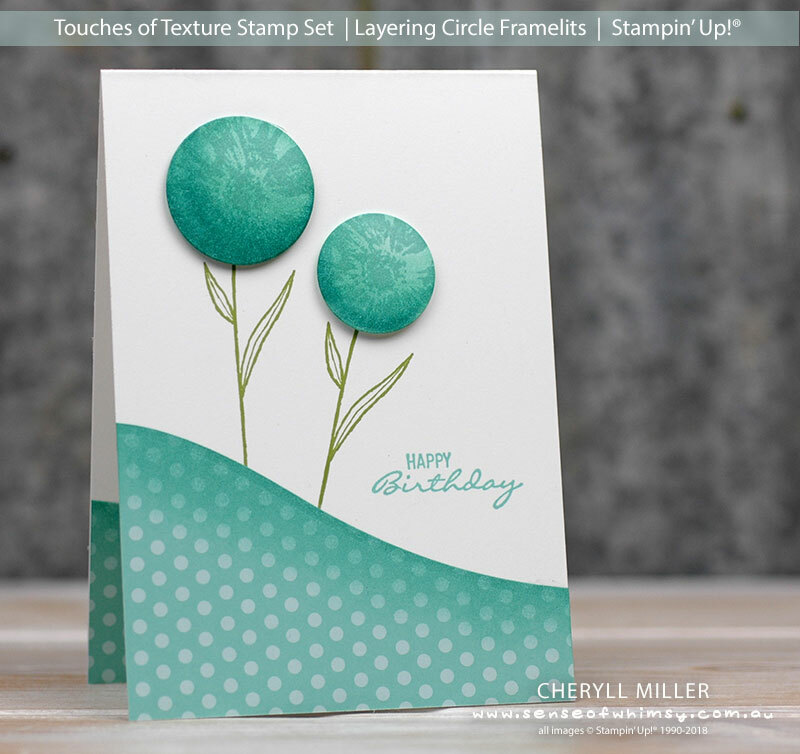 The stems of the flowers are also from the Touches of Texture stamp set. While the card itself is very simple, I drew on a few different stamp sets and dies to finish it off. Spotted ground – Coastal Cabana 6″ x 6″ Brights Designer Series Paper Pack. You may have missed these little packs amongst all the stunning packs of Designer Series Paper. They come in all the colour collections (at the bottom of page 191 of the Annual Catalogue) and with spots and stripes in two different designs in each pack, you will always have a co-ordinating Designer Series Paper option with these babies. Create a slope – I snuck? (sneaked?) in a product from the Holiday Catalogue here, using the long curved die from the In The Woods Framelits Dies to create the gentle rolling curve to cut a spotty garden bed for my whimsical flowers. 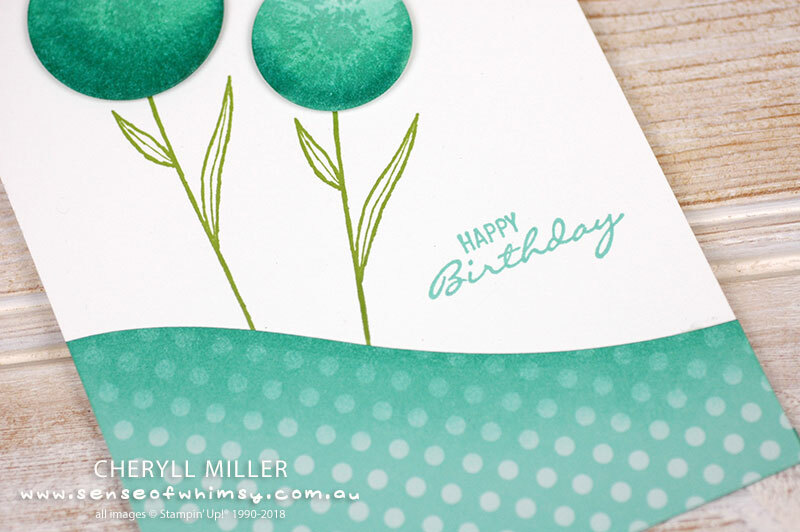 Happy Birthday – This one comes from the Botanical Bliss stamp set. I love the mixture of block and cursive fonts, and it is the perfect size. Perfect positioning – And of course I used the Stamparatus to get everything perfectly placed on my card. I have created a very quick video showing the creation of this quirky card and you can view it here on You Tube. I am sandwiched between two amazing paper artists today … if you have landed here from Lou Kitzelman’s blog, you will already have been wowed by her fabulousness! 🙂 And from here, you absolutely need to head on over to Jenny Hall’s blog who always comes up with a show stopper. And here is the list of video participants this month, there is only a few of us this month, so your cuppa won’t go cold …. Such a lovely card, Cheryll. It’s gorgeous. I love the effect the splatty flower gives. Such a sweet and happy card Cheryll. Your video was great to watch and learn from. Thanks for all the tips and the beautiful card. What a beautiful design Cheryll I don’t think I would’ve thought of doing it that way. I enjoy sharing your blog with you. This is such a cool technique Cheryll. 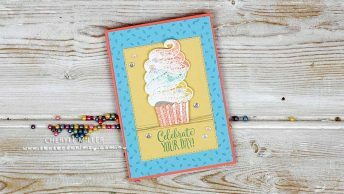 Love the stamping over the Stampin’ Blends. Wow! Really cool technique you shared. Lovely card. I adore the texture you created on your flower spheres! What a great effect. I’ll have to give your technique a try.